Why do Elderly People Experience Memory Loss? 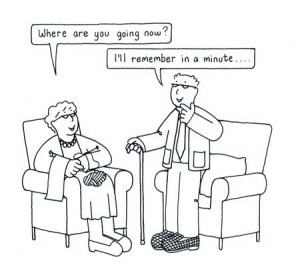 We all know elderly people who have a hard time remembering certain things. Have you ever wondered why they can’t recall all of their past memories, or even recent memories? The obvious answer would be that when people get older, their bodies start to shut/slow down, so they can’t be as quick as they once were. But, there is more to it than that. A discovery by Columbia University was made in 2013, and it found that most people who have memory loss have a deficiency of a protein called RbAp48. According to the article released, the deficiency occurs in the hippocampus, which is a small part of the brain that deals with memory. Scientists also stated that age-related memory loss and Alzheimer’s are not related. It used to be believed that age-related memory loss is an early start to Alzheimers, but they now believe that it isn’t. So, in the experiment, “researchers began by performing microarray (gene expression) analyses of postmortem brain cells,” of people who aged from 33-88. Genes that were related to aging were identified, and it was found that the RbAp48 gene declined the most over time. This led researchers to conduct experiments on mice. They “used viral gene transfer and increased RbAp48 expression” in the aged mice. This not only improved their performance in the tests given, but it made them comparable to the younger mice. This is also encouraging because it proves age-related memory loss is different than Alzheimer’s. In Alzheimer’s, there is a loss of neurons, but in age-related memory loss, there is just a functional change in the neurons. Even though this doesn’t prove that it works in humans, it is a major discovery that could leading to slowing memory loss in aging people. This entry was posted in Uncategorized on September 16, 2015 by Patrick Hryckiewicz.